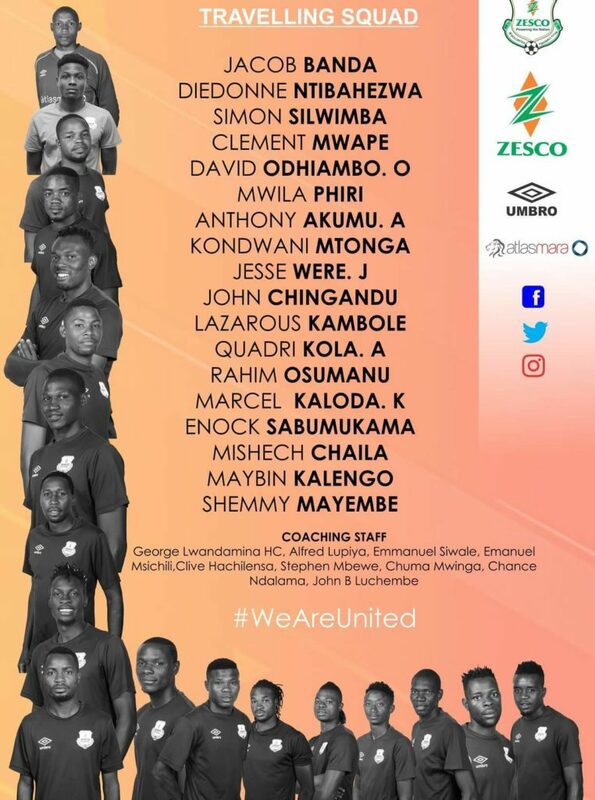 Zambian side Zesco United have named a thirty man contingent for their CAF Confederations Cup game against Asante Kotoko. The thirty man contingent is made up of eighteen (18) players, nine (9) members of the technical team together and three (3) management members. 1- Jacob Banda 2- Diedonne Ntibahezwa 3- Simon Silwimba 4- Clement Mwape 5- David Odiambo 6- Mwila Phiri 7- Anthony Akumu 8- Kondwani Mtonga 9- Jesse Were. 10-John Chingandu 11- Lazarrous Kambole 12- Quadri Kola. A 13- Rahim Osmanu. 14-Marcel Kolunda. K 15- Enoch Sabumunkama 16- Mishech Chaila 17-Maybin Kalengo. 18- Shemmy Mayambe.